Most British editors decided to use the picture of the bloodied man on their front pages on Thursday ... but not all. The Daily Express, for example, opted out, choosing instead an incongruous picture of the Duchess of Cambridge in a bright yellow dress. 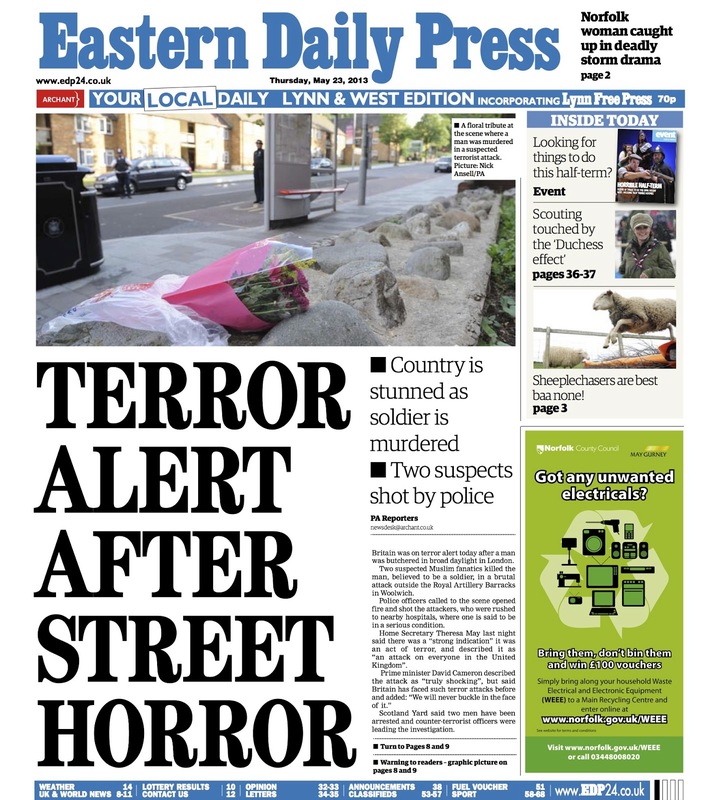 In the regions, the Eastern Daily Press also chose not to put blood on its front page. It opted instead for a floral tribute to the dead soldier with a warning to readers that there were graphic photographs on pages 8 and 9. Today editor Nigel Pickover explains the decision in his Editor's Chair column. He writes: "The sickening picture of the alleged culprit came in from TV sources – and I knew this would be front page news for every national newspaper. 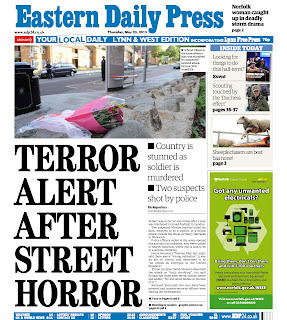 But not in the Eastern Daily Press. I felt the picture was too horrific, just too graphic, for our title’s front page. 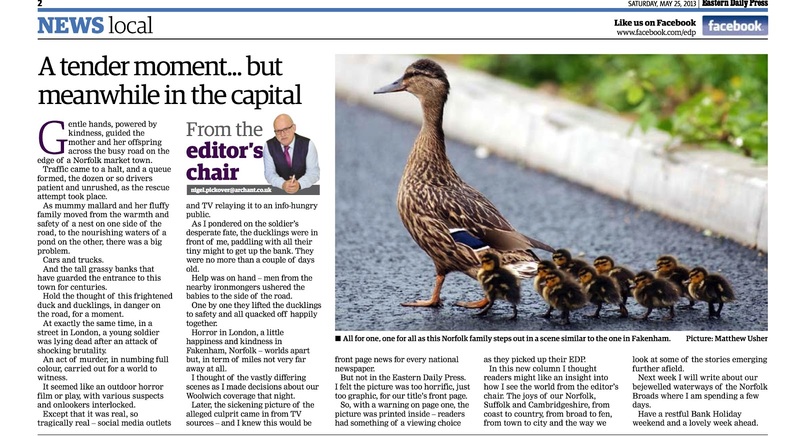 So, with a warning on page one, the picture was printed inside – readers had something of a viewing choice as they picked up their EDP." A brave stance but is it the right one? Well when it comes to copytasting, there is no right and wrong - just differences of opinion. I know many national newspaper journalists who were uneasy about the front page coverage on Thursday ... but felt reluctant to express their disquiet. Pickover is an experienced, hugely respected editor with good judgment, who knows his readers well. And that's what editors do - make judgments, make difficult decisions on behalf of their readers. What is definitely right, though, is that he shared his reasoning with his readers. Hats off for making that decision; the front pages are on view for all to see, young or old. I'm glad my 6 year old daughter didn't see them and ask "What is that picture about Daddy?" - and even more glad I didn't have to answer it.